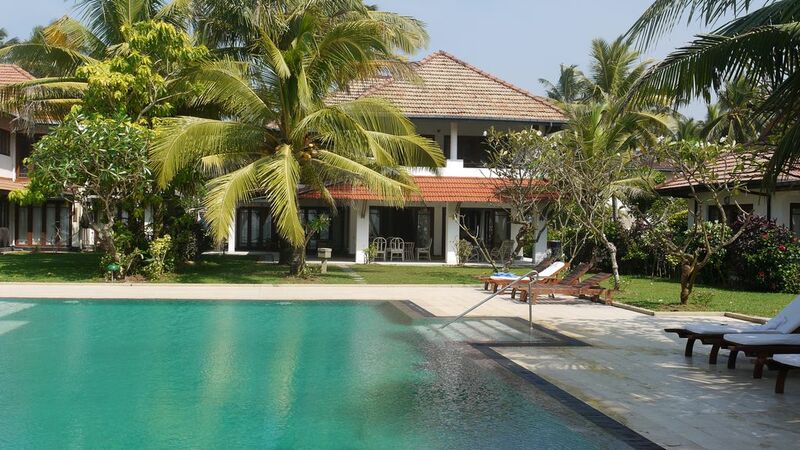 Villa Ad Asra, l’1 des 4 villas partageant les 6000 m² de terrain à côté de la mer, à Wadduwa, à 35 km au sud de Colombo. La propriété inclut : piscine de 16 m, court de tennis en gazon, personnel et gardes. Le salon mène à une terrasse avec des vues sur le jardin, la piscine et la plage. Meublée d’1 table et des chaises pour les dîners à l’extérieur. Jardin rempli de cocotiers, manguiers, anacardiers, avocatiers, citronniers, papayers et plantes de fruits de la passion. Également un petit jardin potager. La maison dispose d’un accès direct à la plage avec une eau constante à 27º. Le chef propose du poisson frais et des fruits de mer. Notre personnel est là pour combler tous vos désirs, vous n’avez même pas besoin d’entrer dans la cuisine durant votre séjour. Le célèbre hôtel Siddhalepa Ayurveda est notre plus proche voisin où vous pouvez réserver des traitements ayurvédiques. Les villas Ad Astra sont proches de plusieurs hôtels de bord de plage avec un grand choix de restaurants. Toutes en ciment poli. La chambre principale a une sale de bains attenante. Les chambres 2 et 3 ont chacune une salle de bains mais pas attenante. Il y a une douche extérieure à côté de la terrasse. Cuisine tout équipée : grand réfrigérateur/congélateur, cuisinière à gaz, four électrique, micro-onde, lave-linge, etc. Il y a tout ce dont vous avez toujours voulu dans cette cuisine dont un chef ce qui peut vous éviter de cuisinier. En entrant dans le salon avec des poutres apparentes en teck et du carrelage au sol, la villa offre une magnifique vue sur la piscine, les cocotiers, les frangipaniers et la mer. Les chaises néerlandaises anciennes et les confortables canapés modernes permettent de se détendre. Toutes les chambres ont des matelas épais et de bonne qualité et ont vue sur le jardin, incroyable avec des cocotiers et des arbres d’Aralya, plantes d’hibiscus et la mer. Le style est moderne, blanc et rouge, orange avec des accessoires roses. Veuillez noter que c’est une maison non fumeur. Un chien très amical vit dans la propriété. La plupart des visiteurs et des enfants l’adorent. Le personnel s’occupe du chien. We have stayed in the willa unfortunately only 1 week....what a shame! We traveled as 2+3 children and everything was just great, location, villa itself, our guide Rex and great cook Pushpa. Without them our stay would be just half experience. Rex showed us amazing places like Yala national park or even the trip around Wadduwa was unique experience. He is such a great person! Food was great as well, we had to take some recepies from Pushpa to try to cook some of the curry at home....although I don't think it will ever be the same. Not to forget all the stuff - they were all such friendly people. Villa + pool = just great. Dear Olof, I have to thank you for letting us stay in your villa, we will come back again for sure! Pushpa looked after our every need and cooked the most delicious meals that everyone including my 2 teenage children loved! The house & it’s stylish decor were spotless and downstairs floors kept clean throughout our stay. There were comfy sofas up and downstairs & the beds were the best I’ve ever slept on, all with mosquito nets. The bathrooms were spotless & had very good showers. In the early morning from our balcony, my husband and I loved to observe & listen to the stunning birds amongst the palms and beautiful foliage in the garden surrounding the villa. Another gem we witnessed was the local fishermen pulling in their catch a few hundred yards along the beach, early one morning. We enjoyed playing tennis on the excellent court and swam in the large pool several times a day. My only regret was that we didn’t stay longer at your property, as being an artist I would love to have had time to to paint the fishermen sea & gardens. Our first couple of days were a bit grey so the light hadn’t been conducive to painting. The day we left the sky was blue & the light was perfect for painting! I took plenty of photographs so have material for working from but it is not the same as painting on location. If you would like to see any of the photos I took just let me know & I’d be happy to share them with you. On our last afternoon Monica the elephant paid us a visit while we were in the sea. The children were thrilled and both rode on her back while she walked along the beach. It was very nice to have you here t would be interesting to see if your painting comes through. Best regards and welcome back. We stayed for a week with our family my wife and kids plus the grandparents and had the most relaxing and fun holiday! The house was perfect with plenty of space for us all and very comfortable indeed. The gardens were beautifuly looked after and the pool was immaculate! We enjoyed this so much! We played Tennis a few times as well despite the rains causing a few tricky patches on court!! Now to the best part! Pushpa was truly wonderful! such a lovely person who took care of the house and most importantly the exquisite food she prepared for us was a highlight of our stay! Thank you ! We would all love to come back in the future! Thank you so much for your kind review. Pushpa and Rex are really valuable for us and contribute a lot in making a stay memorable. You are most welcome back. We were lucky enough to have only two of the four residences in this beautiful development occupied. This gave our house an extra special air of exclusivity. How can anyone not love waking up to overlook beautiful gardens, an enticing pool and the sea beyond. Add to this the care of Pushpa the housekeeper and chef who ensures you enjoy the best of Sri Lanka’s food delights, whether for breakfast or an evening meal. She allows you to have a real self indulgent experience. The sea is a delight - extensive beach which is kept relatively litter free for Sri Lanka and a sandy shore that makes plunging into the waves a joy. The waves are not big enough for surfing and there can be an undertow but hey, lovely warm water to frolic in is wonderful. Whilst local transport (tuk tuk) is easy and cheap the local sights are somewhat limited and there is a dearth of the usual local restaurants. This does not detract from the joys of your “home” at the villa itself. We would have liked better bed linen and towels but this was more than offset by a house that works! The shower is excellent, the bed comfortable and the furniture in good condition. There are books and dvds and generally you are at home in this lovely property. Then there is the tennis court - it has its limitations but it is an excellent facility to work off those self inflicted extra pounds. The court is set within the flower surrounded ‘compound’ which is not just 24hr. guarded but cared for in the very best fashion. As a well travelled couple we can only recommend Villa Margareta as an excellent relaxing holiday venue. Thank you so much for your kind review. We would love to have you back. We spent a week at the beginning of November relaxing at Villa Margareta. We were thoroughly spoilt by Pushpa's wonderful cooking and Rex was a fantastic guide around the small part of the island which we had time to explore. We were lucky with the weather and had 4 beautiful days by the swimming pool and on the beach. Thank you Olof for creating an excellent holiday destination and we hope to return soon! Pushpa, Rex and myself are very glad that you liked it and that your expectations were met. We hope to welcome you again in the near future. Spacious, smart and relaxing Villa. Brilliantly helpful staff. Excellent food! Thank you very much for your kind Review. Our staff tells me that they really enjoyed to serve you and we wish you welcome back. Wadduwa se situe à quelques kilomètres au nord de Kalutara où se trouve le célèbre temple de Kalutara. Le centre de la réserve des tortues se situe à 40 min au sud de Wadduwa. Galle (patrimoine mondial de l’Unesco) est un peu plus au sud, 100 km, à 2 ou 3h selon la circulation. Colombo est à 35 km au nord des villas Ad Astra et offre magasins, quelques importantes visites, de la bonne nourriture et une vie nocturne animée. Booking Notes: . A 25% advance payment is requested to confirm a booking. Balance 75% latest 2 weeks before arrival. Payment through Paypal is prefered. T&C applies. Changeover Day: We do not have a changeover day policy. Notes on prices: Price above are for 2 persons using the entire villa, including chef and cleaning service. For additional guests an additional charge of 25 Euros per person apply. The chef prepares whatever you wish for breakfast, lunch and dinner at actual cost for the ingredients. Optional: Pick up and drop at airport: 50 € one way. A driver and vehicle is available for your excursions etc. Maximum number of guests: 6 adults and 2 children. All taxes included.